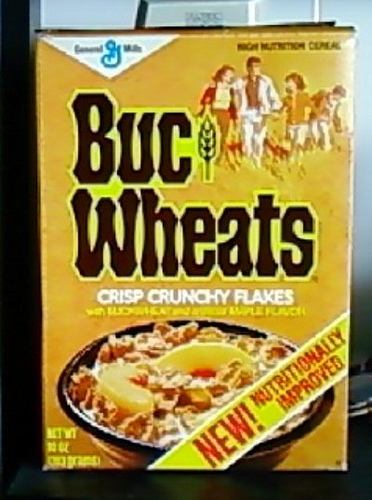 Do you remember Buc Wheats cereal? Not to be confused with Buckwheat from the Little Rascals, or the Eddie Murphy version from "SNL.' They were wheat flakes with kind of a sweet mapley taste. As far as we know (and that teeny Wikipedia entry is no help), they were a pure Gen Xer food, existing only in the 1970s and 1980s. Must not have sold well enough, as they vanished before the '90s. The commercial hypes them as "the only maple flavored cereal flakes." Perhaps there just wasn't enough call for that, or maybe people were secretly pouring Aunt Jemima on their Wheaties, and that was just fine for them. Or maybe, as the first comment on the YouTube commecial suggests, they were awful. But others loved them and are begging General Mills for their return. Maybe it was the name. I mean, have you ever had buckwheat flour? Disgusting! My friend's dad bought a giant bag of it in Europe in the 1980s and had these elaborate plans of making his kids buckwheat pancakes every weekend, but his four girls and their mom all rebelled. The dad halfheartedly made them for himself a few times, and then I think eventually threw the bag away. I love the woman in the commercial. Her only line is "Really good" while holding up the spoon. She won't eat them either.